None of us can control the market conditions that are causing these uncertain times, but one thing’s for sure — we can control the ways that we respond to them. How have economic conditions affected your company’s marketing plan? For many marketers, putting a temporary kibosh on their marketing and advertising budgets is the preferred M.O. But just because it’s a popular choice doesn’t mean it’s the right one. You see, for savvy marketers, an economic downturn, or even the dreaded “R” word itself, is actually a tremendous business opportunity. The best time to be creative about your marketing efforts is when the competition is running scared and there are fewer players on the field. So toss out those “same old, same old” techniques that might (or might not) have worked in the past, and replace them with creative, lower-cost methods that can boost your visibility, customer base and marketing share. 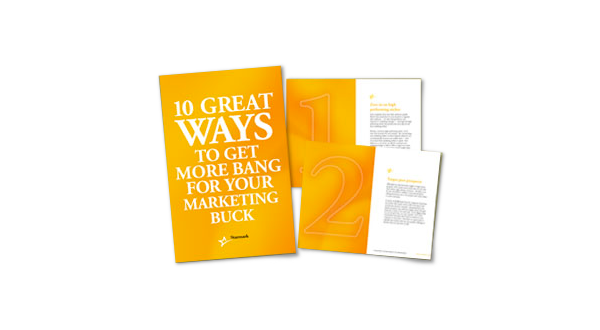 But before you spend a single marketing buck, take a look at our ten great ways to get more bang out of every one. 1. Zero in on high performing niches. Savvy marketers don’t treat their audiences equally. They’ve discovered that it’s more lucrative to segment their audiences — by sales, buying behavior and responses to marketing messages — and target the high performing niches that produce the most sales for the least marketing dollars. During a recession, high-performing niches can be even more lucrative for your business. By concentrating your marketing dollars on these targeted audiences, you can dramatically increase your market share — even if you have fewer marketing dollars to spend. And believe it or not, if you can afford to increase your marketing budget as little as 28% to target your niche, you can potentially increase your current market share by as much as 250% — results that would be nearly impossible to achieve during times of prosperity. It’s the bigger fish, smaller pond theory — during a recession, many of your competitors are slashing their advertising budgets and sitting this one out, so by comparison, it’s much easier for you to get noticed by customers and prospects. Better still, your niches will keep noticing you when conditions improve. As for remembering the competition? Not so much. Although, you may have been taught to forget about prospects after several unsuccessful tries, the old rules don’t always apply during a recession. Actually, it can be very successful to market to your past prospects (dating back about six to 12 months) and convert them to active customers. A survey of 20,000 leads from 23 companies found that six months after initial contact, 56% of prospects had not become anyone’s customer. And going back even farther, prospects may still have budget money that gets freed up as much as two years later. So by digging deep in your prospect lists, you may unearth a rich source of potential customers who’ve had an interest in your company at some point. And that’s an opportunity to rekindle that interest with any new product offerings or features that you may have as well. 3. Look for media deals. We don’t advise that you fall for great deals that don’t effectively target your audiences. However, an economic downturn gives you the opportunity to revisit your current media buys and ask media partners for additional ways to improve performance and messaging. Value-added opportunities abound in a recessionary period when your success is your media partners’ success, and few others would come knocking on their doors to replace your business if you bailed. Of course, whatever the outcome, it must be a win-win situation and that’s where the skill of working media partnerships for better results is valuable. Out-of-Home Marketing – If out-of-home marketing is part of your effort, the timing couldn’t be better to ask for — and get — deals. Billboard space typically becomes more available and affordable during a recession. At the same time, as rising gas prices drive more commuters to use carpools, buses and other mass transit, more new eyes are looking at billboards than ever before. Other effective techniques might include experiential marketing techniques that your target audience would enjoy – after all, though people love being entertained in any market conditions, you’ll make even more of an impact when their personal entertainment budgets are tight. Radio Advertising – Many people believe that as marketing options go, radio is going the way of the Model T. Don’t be one of them. You see, radio actually has tremendous impact in the marketplace. Unlike TV ads, which can get be bypassed by Tivo, radio is one of the few remaining mediums that is intrusive by nature – and that means it gets noticed. Radio is even more effective when it’s combined with experiential marketing techniques, like radio station-sponsored tie-ins and events. Creating attention-grabbing promotions that maximize your exposure and potential for success must be at the heart of any radio plan. Utilize station talent and extend your promotion by guiding listeners to your website. There are lots of details to coordinate, but planned properly, radio can increase your awareness rapidly in recession. No matter what media mix is right for you, less cash can buy a lot more in a recession. 4. Analyze your lead qualification processes to energize your sales force. If you improved your lead qualification processes, how much would that improve your sales force’s ability to close sales? There are a myriad of tools available to help qualify leads and support sales goals, and if you haven’t looked at them lately, now is the time. For example, web-based customer relationship management program salesforce.com features plug-ins like QuickWeb Pro®, a state-of-the-art content management system with integrated marketing capabilities. Marketing channel members can also benefit from increased support from your company in times like these, and tools like the ChannelPro® channel management software solution keep your far-flung marketing channels close, with a host of up-to-date information and professional marketing materials. Monthly or quarterly newsletters can be the glue to keep all members of the selling process in the loop – especially during a recession, when they’re working harder than ever. They’ll appreciate your attention during the down times – and remember you fondly when things look up. Being first online sometimes means getting not only good value for your marketing dollar, but also a lot of editorial attention for being among the first to try something new. Mobile marketing: Recently the New York Times reported that nearly one in five cellphone users received ads in the form of text messages — a 25% increase from the year before. This explosion of personal digital device usages is an incredible opportunity for smart marketers. Call it your own. Virtual trade shows: In July, 2008, Nielson held its second virtual trade show for meeting planners, featuring “trade show booths” of major hotels, manned with “live chat” opportunities with sales people from each property. The online event was an astounding success that continues to attract travel and hospitality industry attention and interest. YouTube.com and Facebook.com: While seemingly “old hat” already, these sites have an amazing ability to reach their target audiences. If those audiences are yours, then you need to be in the game. Linked-In Communities: For business marketers, unique Linked-In communities are becoming more and more popular. Not only can you network through the professional databases of your network partners, but you can also establish a separate community that you can market to and use for marketing questions/surveys — as long as you don’t overstep the bounds of professional networking etiquette. 6. Redirect some media budget to public relations. A public relations campaign is a high-impact, affordable way to boost visibility and credibility, especially in a tough economy. Developing a multi-faceted PR strategy that combines social networking, thought leadership, events and media relations creates the perception of your company’s success – even if it hasn’t actually arrived yet. Now is the time to be aggressive, proactive and tell your story, keeping your company at the forefront while competitors fade into the background. The public (and your employees) will perceive your company as a leader in its field…and that successful image just may become reality after all. After all, companies that “go quiet” in a recession risk losing share when the recession ends. 7. Focus and control your messaging with your own custom media. By creating a company magazine and revitalizing your collateral materials you can propel your company image and keep your employees, customers and marketing channels members motivated and informed. These materials prove to your stakeholders that they’re important to you, and at the same time, show them you have a clear vision of the future and the ability to back it up – even during an economic downtown. All of your important audiences will appreciate it…and they’ll remember. During a recession, it’s more important than ever to keep your customers from jumping ship. According to the Harvard Business Review, reducing customer defections by just 5% can increase your profits by 25 – 85%. So it’s just plain smart business to deepen relationships with your customers, increase their loyalty and prove just how much they mean to you. If the cost of printed magazines puts them out of the picture, online publications are an effective and affordable option, eliminating the need for printing and postage costs, and giving you the option to track and measure results. Better still, your customers really like these publications — and, by extension, your company. 8. Include viral components in your online messaging. It took many companies, who were otherwise savvy online marketers, several years to adopt a small feature called “Forward to a Friend” in their emails and online promotions. Depending on the viral aspects of the promotion, this handy feature can more than double the response to your promotion and introduce you to thousands of new prospects and customers you may not otherwise have targeted or reached. A recent World Advertising Research Council report found that by 2011, online usage is projected to grow three times faster than any other medium. This remarkable growth means even more opportunity to be viral and multiply your potential for success exponentially, as well as lower distribution costs for your message. Of course the secret is to come up with the types of promotions that your target market finds good enough to share. Your advertising agency can be an excellent source of suggestions. 9. Go global by translating your website into other languages. English may be the international spoken language of business, but business people prefer to read in their native languages. In fact, 70% of Internet users read content in languages other than English. So instead of just targeting the 30% of English-only Internet users, increase your exposure — and potentially, your sales — by tapping into global markets and translating your website into languages like Chinese, Spanish, Japanese and French. There are translating companies that can help you achieve this, as well as shipping partners that can make selling overseas easier than you might think. Your ad agency should be able to help arrange both. 10. Try webinars instead of seminars. Today’s webinars are the sales presentations of tomorrow. Technology companies, always early adopters, embraced this opportunity to attract otherwise unreachable prospects several years ago. But now everyone else is catching on, and webinars are quickly becoming the seminar of choice for busy executives — especially now as gas prices rise and the IRS reimbursement allowances lag. The keys to producing a successful webinar are pretty straightforward: valuable subject matter, appealing pre-promotion techniques, high quality presentation and effective capture of participant data and follow-up. If all of these elements aren’t handled properly, your webinar may not attract the attention (and attendance) you’re looking for. An experienced communications consultant can help ensure results. Keep a vigilant watch for new cost-saving technologies that can revolutionize the way you do business. These emerging technologies can improve your current methods for launching new products, training your employees, holding company meetings and much more — at prices that may very well surprise you. Embracing these techniques sooner, rather than trying to play catch-up later — can put you way ahead of the pack. 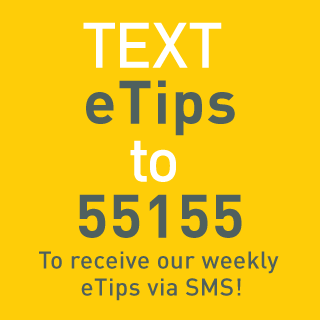 Okay, so how do you begin to make these tips work for you? Choose an agency that does it all — like Starmark International. We’ve got the tools, the expertise, the street smarts and the proven ability to help you not just weather this economic storm, but flourish — after all, we’ve been doing the same thing for our clients for 30 years, including 10 years in South Florida. Give us a call — we’ll be happy to talk to you about your future success, or even provide a friendly second opinion about your current plan. Either way, you’ll be well on the way to getting a lot more value (okay, bang) out of every marketing buck.